A few weeks ago, Marvel Studios released yet another movie in their epic superhero franchise: Guardians of the Galaxy Vol. 2. This rip-roaring space opera comedy led our favorite criminals-turned-heroes to the furthest reaches of the galaxy to learn not only what it takes to be heroic but also what it means to be a family. Here's what we thought of the film. Well. This movie destroyed me. And did it in the best possible way: with humor, tragedy, a scrappy found family, and a whole ton of awesome 80s music. Honestly, though, my favorite thing about this was how much (and how well) it develops themes introduced in the first movie. 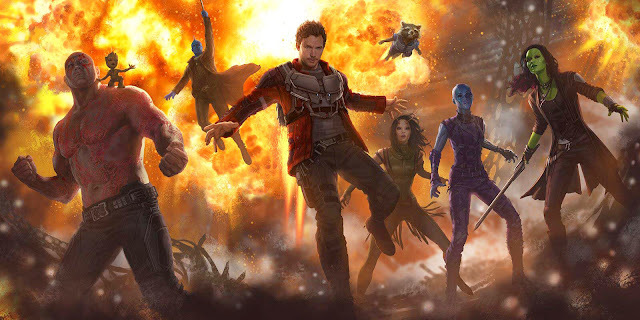 GOTG set up its characters as not just business partners, or even friends, but as a family; GOTG Vol. 2 is all about the reality of a bunch of imperfect people trying to figure out how to be a family when some of them aren’t quite sure what “family” means and all of them are a little fuzzy on what makes a good one. And in the end, it’s not about being perfect (there’s not a single perfect relationship in Vol. 2) but about being there for each other and doing their best. I don’t want to spoil the story for anyone who hasn’t had the chance to see it yet, but prepare for a certain character’s redemption arc (that’s as beautiful as it is unexpected), hilariously spiteful banter between Rocket and Peter, and a rainbow of incredible special effects. I can’t think of a galaxy I’d love to visit more—and that’s including Star Wars’ galaxy far, far way. Oh, and one more thing: Baby Groot is every bit as precious as he was in the trailer. But don’t underestimate him. He’s surprisingly deadly. If someone had told me back in 2008 that Marvel movies would not only end up in outer space but include a whole cast of characters that aren't as well known in the comic book world, I wouldn't have believed them. Yet with the release of Guardians of the Galaxy Vol. 2, this is where we are. Not only do we have the Guardians, who weren't as well known until their first movie, but we have other smaller characters alive and breathing in the MCU: Ego, Ayesha, Mantis, and... Adam Warlock. It's incredible. It's fantastic. That's basically how I felt about the entirety of GOTG Vol. 2: incredible and fantastic. The story is one wild ride of bizarre and hilarious, cosmic-sized events. The dialogue is perfect from Starlord calling Rocket trash panda to Rocket making fun of Taserface to Yondu's Mary Poppins comment. It has everything a comedy needs yet it's smashed together with science-fiction world-building and space opera action. It's a great follow-up to the first installment, continuing the Guardians' journey into becoming somewhat of a heroic crew while not back-tracking anything that was established in the previous film. But it goes beyond the first film as well, diving into more Guardians lore and ideas, introducing new characters, and keeping the focus on what makes the Guardians so special: family. I liked Nebula and Gamora's strained sister-relationship, even feeling remorseful about Nebula's past, and how they eventually lean on one another. I adored Mantis. When I heard they were including her, I was excited because she was quirky in the comics, but this Mantis is even better than I imagined. She has this soft-spoken innocence and introverted outlook that I can relate to. Plus, she's just so darn cute, and her friendship with Drax was amazing. I was stunned by how much in common Rocket had with Yondu. I was not expecting 1. their connection to be so moving and powerful, 2. for there to be more to Yondu and Peter's back story, and 3. to care for Yondu at all, since I kind of hated him in the first movie because he acted like a scumbag. But by the end of the movie, I did care for him and I was sad to see him die. (Maybe Marvel will do their magical thing and bring him back, but I'm doubtful.) Baby Groot was adorable, but Teenager Groot was just hilarious. These writers, man. They nailed it. 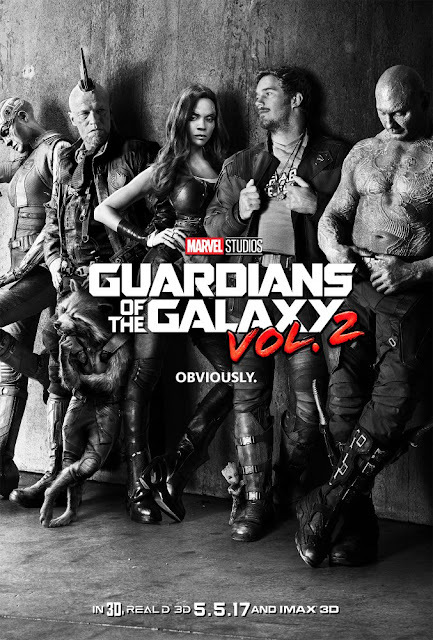 Rocket, Drax, Baby Groot, Peter, Gamora, they were all fabulous and the story was fun. I hated Ego, which is a good thing, and I knew he wasn't good news. Poor Peter. But the part that got me the most was during the end credit scenes when they name dropped Adam, as in Adam Warlock. I was so excited I audibly gasped because it was a name I knew from the Guardians comics. I knew he was important, although my brain couldn't remember why at the moment, but after a quick search, it became apparent he's more than important, and now I'm excited to see how he will play a part with the Guardians in future movies! When I watched Vol. 1, I knew nothing about Guardians of the Galaxy. What brought my attention to the film was that I knew Chris Pratt was starring in a superhero movie! However, for Vol. 2 I not only came for the Pratt, I came for the picture, and I have to say that I may actually like Vol. 2 a bit more than 1. At the very least, they’re comparable, and if I could say I enjoyed them equally, then I’d go with that. Just like the title suggests (Vol. 2), we get an amazing score. There’s even music blasting while the guardians pummel, pulverize, or perfectly plunder from all enemies, while firing off quick, witty retorts. Just the first sequence alone warranted an applause. (Plus, baby Groot is cute!) There’s even one part in the movie (though I won’t spoil it) that promises even more music to come! In addition to fight scenes and clever comic book tie-ins, I also enjoyed the characters! They can be quite hilarious, and I appreciated that (this makes it easy to merge with the Marvel universe), but even beyond that, the characters are something special. The characters all fall under a trope that has always fascinated me: anti-heroes. These superheroes aren’t your typical cookie cutter, save the day individuals. In fact, they were all once criminals and, in some instances, still are... as seen early on in the movie (*sigh* Rocket). But because of this, the audience also sees the complexity of human nature (or... alien nature?) that makes itself apparent throughout the story. I’m not saying that the epic, golden boy hero is bad, just that it’s important to represent not only a hero’s strengths but also his or her faults. Makes them more relatable. And though maybe we don’t go out and steal prized galactic batteries from a crazed “perfect race,” we all have a dark side that we must live with and learn from. Anti-heroes also strengthen another theme: the importance of family. Whether that family formed due to blood or friendship, because it means that regardless of your path, the bond should be treasured. This motley crew, criminals or not, wins the audience’s hearts because of their unwavering camaraderie. So, *ahem*... We are Groot! Seriously, though, every single character in this franchise is so amazing. Every time I try to decide on my favorite, I fail. Most of the time I think it's Rocket and Groot, but then there's STARLORD, and Gamora, and... and...!!! This movie made this decision even harder because of its new characters and development of old ones. In particular, Yondu and Nebula endeared themselves to me, and I also have a new appreciation for Drax. The addition of Mantis was great as well, and I liked the enhanced role of Kraglin as well. But what really makes this movie shine is its core Guardians, and oh my gosh, do I love them. I had forgotten how much I loved them. They are like shining stars in a sea of darkness... except they're really more like diamonds in the rough. I absolutely love that they're not perfect. That's what makes them so incredible. One of my favorite parts of this movie is that I laughed so dang much. I don't know if I've ever laughed this much at a movie. I still smile when I think about it. This movie is my happy place. My absolute favorite part of this movie was Baby Groot. Every time he came on screen I had tears in my eyes from laughing and sheer adorableness. He's adorable and precious and I want to protect him from everything. Though, I think he could fight everyone for me anyway. I thought that the plot line involving Starlord's father was interesting. I knew he was a bad guy right from the start--how could you not with a name like Ego? The twist with his children was absolutely sickening. Though I did find the parts where he was talking to them from the core slightly uncomfortable, I liked the overall concept. (And the subtle face in the planet was cool.) I loved the scene where he and Peter play ball. Also, that plot twist where Ego's the one who put the tumor in Peter's mom's head? I gasped in utter shock. This movie just... got to me, guys. That's really what it all boils down to: this movie got to me. Heart and soul. I've said it before and I'll say it again: I'm in love with the frickin' Guardians of the Galaxy. Every single one of them. They're not my friends. They're my family. What did you think of Guardians of the Galaxy Vol. 2? React with us in the comments!